Is the IDEAL Breast Implant My Best Option for Breast Augmentation? In November 2014, the FDA approved yet another breast implant called the “IDEAL Implant“. The implant is designed by Dallas based plastic surgeon Robert Hamas. 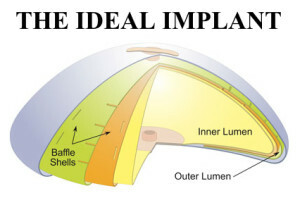 The implant is double lumen and both lumens are filled with saline (salt water). According to the company, this double lumen design gives a more natural feel, similar to silicone gel implant, with the added peace of mind of easy detectability if the implant should rupture. I have not had any personal experience with this implant, so my comments may need to be updated as I evaluate this implant. My first concern is the name. There is NO ideal implant available at this time. All implants eventually leak and all implants eventually develop capsular contracture. I feel the name chosen by the company is misleading. The data collected over two years showed a higher complication rate and deflation rate than the other FDA-approved companies: Mentor®, Allergan, and Sientra®. My understanding is the price of these implants will be close or similar to silicone implants. So the question is: why switch at this time? I guess if the company can show similar capsular contracture and deflation rates at five and seven years as the other companies AND the implant does feel and behave as natural as a silicone implant, then this implant is a viable option for patients who want the peace of mind of saline implant in case of a deflation. For now, I recommend a wait and see strategy for patients until several more years have passed and more data is available. Michael A. Jazayeri, M.D. is a board-certified plastic surgeon with over 17 years of experience. His office is located in Orange County, California. To schedule a complimentary consultation, please call 714-834-0101.